The new H9 sports a super-low bore axis and combines the best traits of striker-fired guns and the 1911. Every year or two a product is introduced that completely captivates the marketplace because of a unique design or feature. Last year that product was the Hudson H9 from the previously unknown company Hudson Manufacturing. Debuting at the 2017 SHOT Show, the all-steel Hudson H9 was marketed as having the best features of striker-fired guns while having a 1911-style trigger pull—the standard against which all other trigger pulls are judged. When a completely new product is launched, there is always uncertainty whether it will make it into production, especially if it’s from an unknown company. (Bren Ten anyone?) 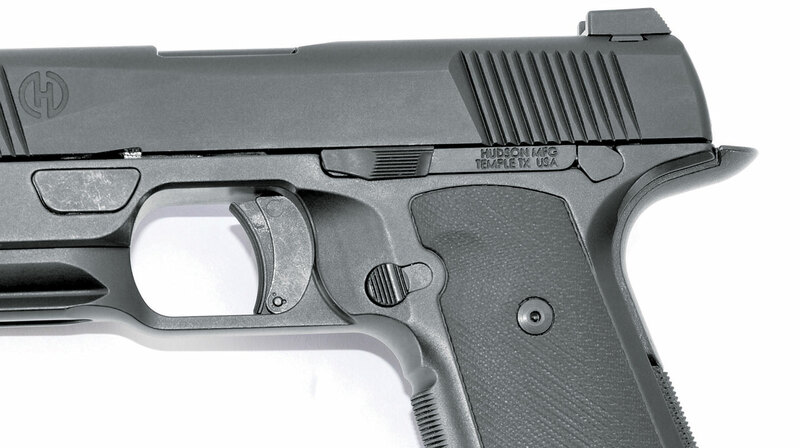 However, by the end of the year, Hudson Manufacturing had started shipping its H9, and what draws the eye of everyone who looks at this pistol is the big hunk o’ metal forward of the trigger guard. At first it looks like the pistol might have an integral flashlight, laser or integral suppressor, but it’s none of those. If you’ll look at the photographs, you’ll notice how darn low the bore is. The barrel is barely above the frame. This is possible because the recoil system (guide rod and spring) has been moved down and positioned in front of the trigger, allowing the bore to be as low as it can be. The steel guide rod is captured in the front of the frame, as is the flat-wire recoil spring, which makes takedown and reassembly easy. Hudson uses a unique locking block to lower the pistol as much as possible toward the frame. The key to the Hudson design is the lowering of the bore, which sits as close to your hand as possible—a setup that keeps muzzle rise to a minimum. Bore height off the hand is the single biggest contributor to muzzle rise. It’s simple lever/fulcrum physics, and it’s more important than caliber or pistol weight. For example, my 24-ounce 9mm Glock 34 has less muzzle rise than my 42-ounce all-steel 9mm SIG P226 despite a huge weight disparity, solely because of the latter’s significantly higher bore. Not only is the bore lower on the H9, but also the recoil forces are being directed back at a much lower spot on the frame due to the position of the recoil spring. Currently, this pistol is offered only in 9mm. It is fed by a steel 15-round magazine, and three magazines are provided with the gun. Time out for a round of applause at that because the H9 uses proprietary magazines, and instead of providing only one with the gun and up-charging customers who wanted more, Hudson provides as many magazines with the gun as most users might ever want. The magazines for the H9 have a distinctly retro feel to me. Looking at them, I’m reminded of Browning Hi Power and SIG P226 magazines. They have rounded polymer base pads that fit flush with the frame, although there is a cutout at the front (matching one on the frame) that allows users to dig in a fingertip and hook out stuck magazines if necessary. The H9 sports a 4.3-inch barrel. Overall it is 7.6 inches long and 5.2 inches high. At 1.2 inches across, the pistol isn’t any thicker than its competitors, but it is a bit heavier than the average striker-fired pistol at 34 ounces because it has a steel frame. Both frame and slide have a black nitride finish for corrosion resistance. This is a full-size pistol, bigger than what most people would be interested in carrying concealed, although that is surely is possible. I’ve carried bigger and heavier guns than the H9. The oversize front end isn’t any bigger than a flashlight clamped to a frame rail, and the cool new things among the gadget-obsessed crowd are medium- to full-size concealed-carry guns sporting flashlights and slide-mounted red dots. The Hudson H9 isn’t any bigger or heavier than those, and as I write this, at least 14 holster companies are making holsters to fit the H9. The rear sight is a plain black model with serrations and a U-shaped notch. It is paired with Trijicon’s excellent HD day/night front sight. The features on the H9 seem well thought out. First, the sights. The pistol sports a Trijicon HD front sight with an orange dot. The Trijicon HDs are considered by many, including me, to be the finest day/night sights currently on the market, and in the center of that bright orange dot, you’ll find a tritium insert that glows brightly in the dark. The rear sight on the H9 is not the corresponding Trijicon HD factory piece. It is serrated, has a U-shaped notch and is plain black, which is exactly as it should be. Rear sights are window frames: You look through them, not at them, and putting bright dots or lines on a rear sight just distracts the eye from the all-important front sight. The top of the slide between the front and rear sight is serrated. Back when I was a teenager poring over gun magazines in the golden era of custom 1911s, I read this was done “to reduce glare.” This might be an issue if you’re sending a lot of rounds downrange on cloudless days while in the sizzling high desert. (FYI: Most of the shooters and gunsmiths of the era did just that, at a place called Gunsite under the tutelage of some guy named Jeff Cooper.) However, for 99.8 percent of the rest of us, serrations on the top of the slide don’t cut nonexistent glare but rather just look cool and add a semi-custom feature. On the slide you’ll see cocking serrations front and back that look good in addition to being functional. Just as great, to my mind, is the raised checkering on the front of the frame. On a 1911 the piece at the bottom rear of the frame would be the mainspring housing; on the H9 it is simply a backstrap, and it is also checkered. It is G10 and made by Hogue. (If you’re unfamiliar with G10, it is a strong composite laminate often seen in grip panels and folding knife handles.) Between the backstrap and frame checkering and the VZ G10 grip panels, the frame has a very “custom 1911” look. The safety lever on the H9’s trigger pivots from the bottom and not the top. There’s no thumb safety, but you can see the gun is set up to accommodate one as a future option. You’ll notice a small beavertail on the rear of the frame. It is a separate piece from the grip, but it is not a beavertail grip safety of the type seen on 1911s. 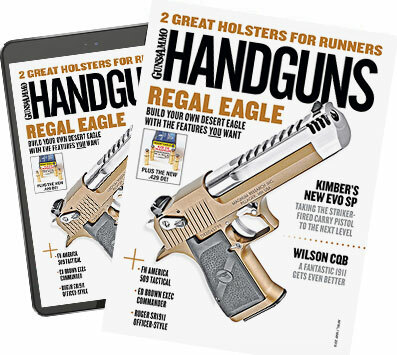 For people wanting an additional safety, or for 1911 purists, Hudson does plan to offer 1911-style thumb safeties: right, left or ambidextrous. You can see the plug in the top left side of the frame where that safety will fit. The slide release is ambidextrous and has a nontraditional profile. The magazine release is reversible and looks like a pure 1911 design. Factory specs call for a trigger pull of 4.5 to five pounds. The trigger pull on my sample was 4.25 pounds and crisp, fully at a level commensurate with good 1911s. Hudson says trigger travel on the H9 is 0.1 inch, which is roughly what you’ll see with most factory 1911s and much less than you get with most striker-fired guns. The trigger has a pivoting lever on it. It’s a safety. The only unusual thing about this lever is that it pivots from the bottom. After you take up the slack in that lever, the trigger slides straight back as you pull it—just like on a 1911. In fact, if you take the H9 apart and examine the trigger bar, it looks at its heart to be a trigger meant for a double-column 1911. While trigger pulls on striker-fired guns have been getting better over the years, they still aren’t as short and/or crisp as what you find on a 1911. The H9 has a darn good trigger, as good or better than some factory 1911 triggers I’ve pulled over the past few seasons. 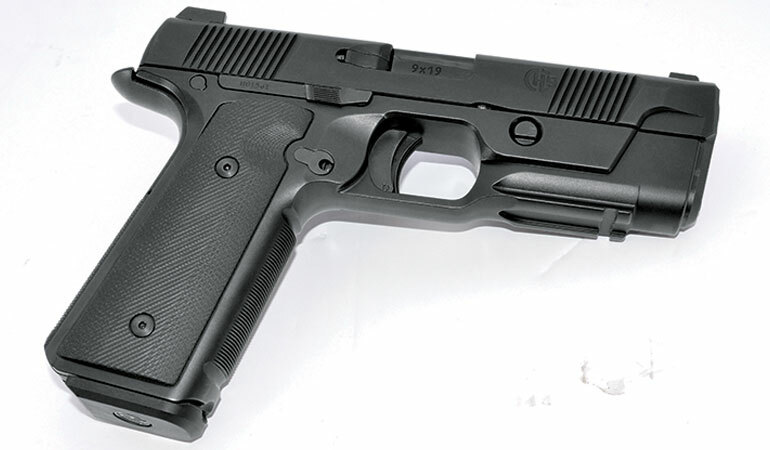 I read a review of this pistol in which the writer attributed his initial poor groups with the H9 to the pivot-from-the-bottom trigger on the H9. I’m a notorious trigger snob, and I didn’t even notice the pivoting face on this trigger when shooting because it provides almost no resistance. Also, the pivoting lever is the entire point of contact between your finger and the trigger. I simply noticed the short pull, crisp break and short reset. Accuracy was on par with most other pistols of this size, and I experienced no malfunctions. The magazine well is nicely beveled, and there is a cutout on the front to assist in stripping out balky magazines. I like the looks of the H9. It is streamlined and simple. I think in both function and appearance it splits the difference between a 1911 and a modern polymer-frame striker-fired pistol. I grew up on custom 1911s, and the checkered frontstrap and mainspring housing and thin grip panels of the H9 really speak to me. Back when I carried a 1911 every day, I would spit on the 9mm because it was such a weak and ineffective cartridge, but things have changed. Now the 15+1 9mm capacity of the great trigger/low muzzle rise H9 is exactly the kind of combination I want in a carry gun. 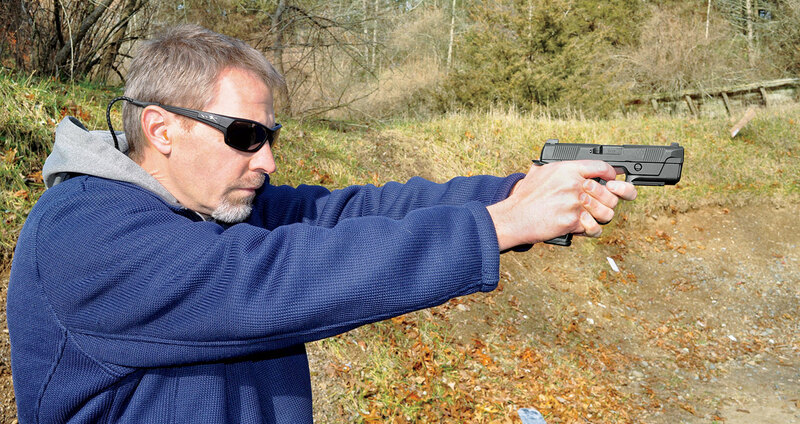 Does the H9 succeed in its goal of low muzzle rise and reduced recoil? First, the recoil impulse is not a gentle curve. It is rather sharp, probably due to the fact this is an all steel gun and there is no polymer to flex and absorb some of those recoil forces. 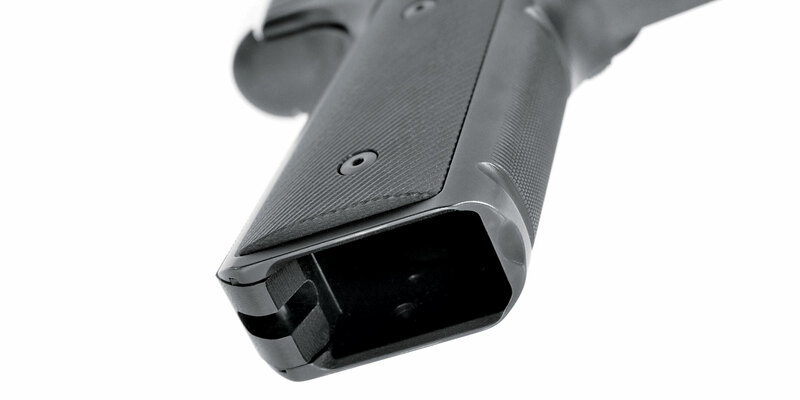 But the low bore of the H9 means the recoil goes straight back into your hand, and the muzzle rise is minimal. With the big orange dot on the front sight, it is easy to track the sight in your peripheral vision as you shoot. To be honest, any pistol chambered in 9mm and weighing 34 ounces is not going to have a lot of recoil no matter how high the bore sits off your hand. But it is the bore height that is critical, not the weight. In fact, Hudson recently unveiled prototypes of the H9A, a version of the H9 with a fiber-optic front sight and an aluminum frame. Coming in at only 26 ounces, it’s a full half-pound less than the H9, but I found felt recoil and muzzle rise nearly identical to the heavier all-steel H9. Is the muzzle flip reduction or good-as-a-1911 trigger on the H9 so impressive that the price increase over the average polymer-frame striker-fired pistol is justified? To my mind, the solid performance of the H9 doesn’t make it worth the extra money, but its uniqueness does. Most people can’t shoot well enough to justify the price tag on a $3,500 1911, but usually they’re not just paying for performance but also the name on the slide. On the striker-fired side, gunsmiths and consumers have been cutting on slides and stippling grips on these guns to make them not just perform better but look special, and that work isn’t cheap. For the same amount of money as that custom work—or less—you can get an H9. It doesn’t look like anything else on the market, and it’s a solid performer. Weight (no magazine): 34 oz.